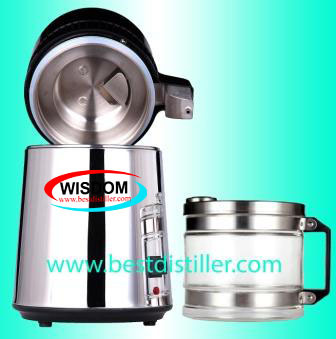 The latest design with fully stainless steel counter top distiller includes the distilled water outlet faucet is also made of stainless steel. 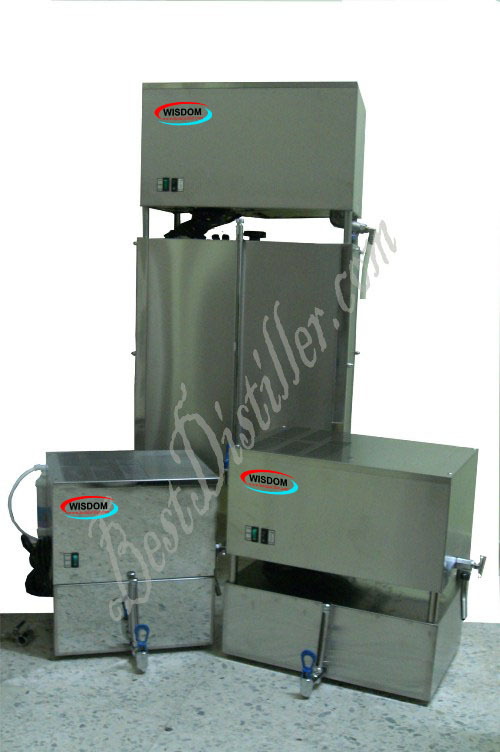 Water Distiller model TC-204SG comes with glass container and build with removable stainless steel plate cover. 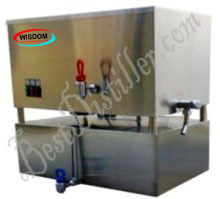 Water Distiller model TC-204 comes with white body and equip with stainless steel boiling chamber and underlid. Glass container with removalbe top lid. Distillation is the only process that collects the pure steam! The steam rises from the water, leaving virtually all other contaminants behind, and then we cool the steam down into pure water! Model: TC-203SG is complete build with inner boiling chamber and the outer jacket both made of stainless steel with Glass collection bottle. Manual fill & automatic shut off. Distillation is the single-most effective water treatment method! Our best water distiller will remove 99.9% of contaminants. Model WS-303 with its removable tap water container make water refilling easy. With 4 lits a cycle and 16 lits a day will definitely make enough fresh drinking and cooking water for a family of 6 people. 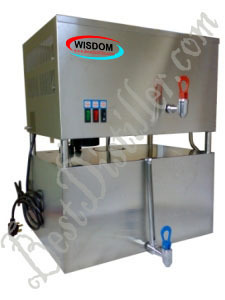 With this compact distilling system you are rest assure of pure water glass after glass, day after day, year after year! Distillation is the only process that boils the water, which means that distillation kills bacteria, viruses and other biological contaminants!! Also during boiling process, inorganic chemical is evaporated while it is at low boiling temperature. This Model TC-6 is a 6 lits per cycle and may be possible of making 12 to 24 lits a day. 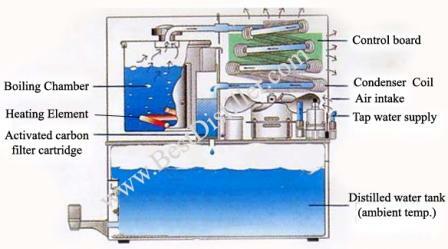 It is also the only compact system that can desalinate sea water and use to home produce alcohol. Distillation is the only process that collects the pure steam! The steam rises from the water, leaving virtually all other contaminants behind, and then we cool the steam down into pure water! Model: TC-202SG is complete build with inner boiling chamber and the outer jacket both made of stainless steel. Manual fill & automatic shut off. 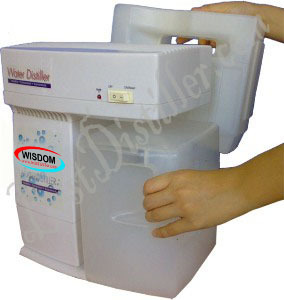 This is water distiller model TC-202S that comes with a poly-carbonate container. Model: TC-202S is complete build with inner boiling chamber and the outer jacket both made of stainless steel. Manual fill & automatic shut off. 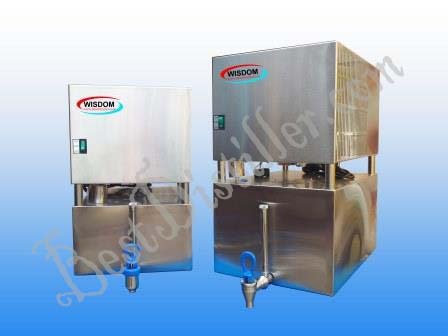 With our WISDOM water distiller system, your need for clean drinking water for consumer needs is well satisfied. You wouldn't think of making soup or coffee with tap water of filtered water which is not completely clean. You should be careful on what ever goes into your body as it has direct affect your health. That means you should feel comfortable using our quality water distiller. When you own our water distiller, your investment continues to pay for itself year after year. Model TC-500 produces 18 lits a day and has its own storing tank. 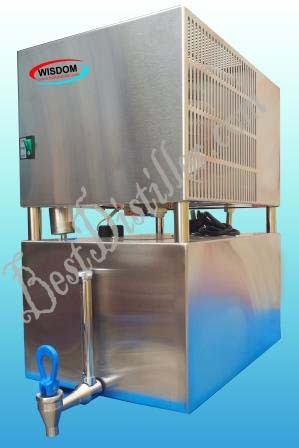 This is fully automatic water distiller with auto filling and auto shut off. Distillation produces extremely consistent results! There is no drop in quality over time. It produces consistently high quality water glass after glass, day after day, and year after year. Model: TC-501 is a fully automatic distillation system build with 24 lits water storing steel tank and with the maximum of making 26 lit per day. Automatic fill & Automatic shut off. Distillation is extremely reliable!! Since there are no physical barriers to break down or fail, a good distiller is very reliable and has a very long life span! This Model: TC-502 with 32 lits storing tank and all the TC model display here will definite be call a reliable water distillation system. It makes tap water free from all impurities. Automatic fill & Automatic shut off. For distillation process, the quality of best distilled water is not related to the quality of the source water! It will produce consistent quality regardless of the quality of the source water. Model: TC503 is a larger system and with a 40 lits storing tank practically suitable for small and large family. It is Automatic fill water and Automatic shut off when storing tank is full. This Model: THC600 is a double storing tank with hot distilled chamber and another storing chamber for distilled water at ambient temperature. Storing tank size is 24 lits and another is 4 lits. 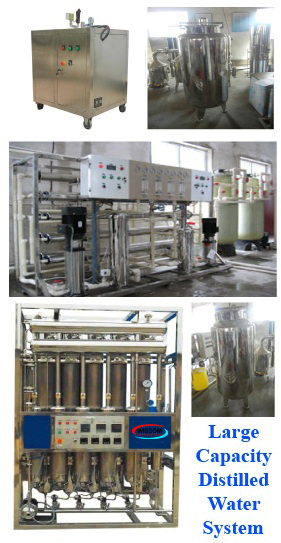 It is a luxury distiller for the upper class buyer who want a more complete water quality distillation system. Automatic fill and Automatic shut off. Distillation is recommended by doctors & nutritionists Endorsed by top doctors and nutritionists in books such as Fit for Life, Fit for Life 2, Optimum Sports Nutrition, Nutrition for Endurance, Prescription for Nutritional Healing and many, many more. Model: THC601 is the bigger brother of THC600 where a larger storing capacity for the luxury class consumer. 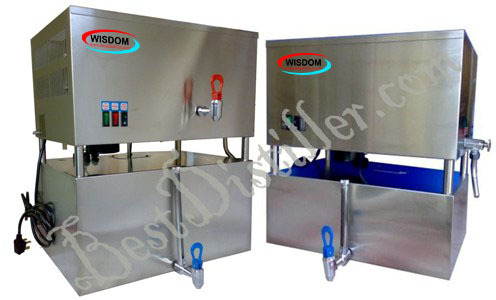 It have a hot water storing tank of 6 lits and another 28 lits storing tank for distilled water at room temperature . It Automatic fill & Automatic shut off when storing tank is full. Distillation exactly duplicates Mother Nature’s hydrologic cycle, nature’s primary method of purifying water. This super extra large model is specially designed with a pre-heating system for energy saving. It is probably the only unit in its class that is designed in this way. Model: THC 602 is the biggest dual purpose distillation with storing tank for hot is 6 lits and another at ambient temperature of 40 lits. Also with self sterilizing features that uses steam to sterilize the carbon filter. A distiller of its own class: Automatic filling and Automatic shut off. Model: TC-506 is a larger storing capacity of water distiller for the luxury class consumer and even industrial with the capacity of 80 lit per day. 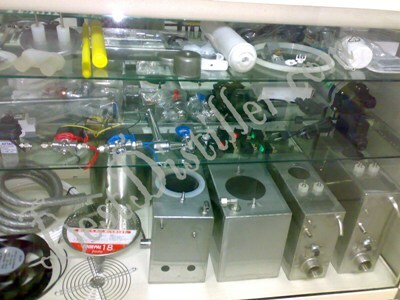 The needs for larger distiller usually involve university, pharmaceutical industry, electronic industry, and autoclave. 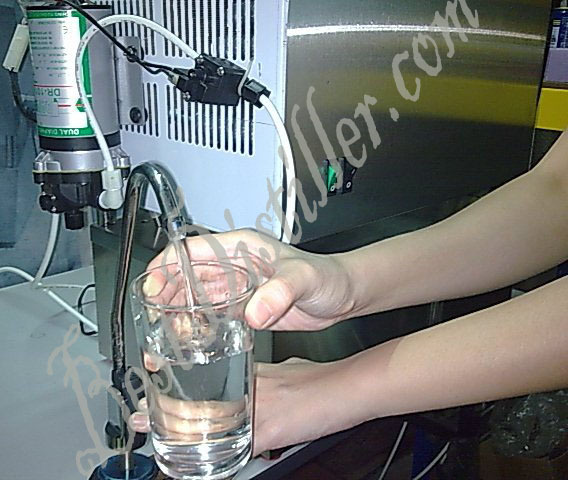 TC-506 water distiller is an industrial water distiller for higher demand of best distilled water. TC-506 capable to produce 80 lits distilled water a day. This unit operates quietly with latest designed silent fan. Latest air cool technology water distiller with capacity 130 lits/day is a custom made water distillation system. This is a fully automatic air cool model uses an electronic circuit board to control the flow from water inlet , boiling process, and control of water level in distilled water storing tank. Equip with a 100 lits high grade stainless storing tank and distilled water level sensor to control water level inside distilled water tank. Large Capacity Distilled Water System for diapers, glove, food, pharmaceutical manufacturing industry. Our distillation system can produce 100 lits/hr, 300 lits/hr, 500lits/hr distilled water. By using water cool technology, Model WDZ-5 is able to produce 5 lits of best distilled water in one hour. This model can be used for making battery water and distiled water for small factory. This WDZ-5 operate voltage 220V and it can run 8~10 hours a day. Our Demineralizer is the pre-filter for fully automatic models. This is the latest technology of pre-filter which can break down particle found in hard water and is more durable. The shelf life for this pre-filter is 7 years. 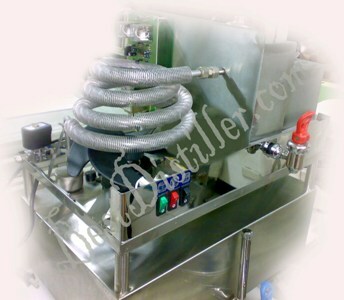 By using this Demineralizer, the heater inside boiling chamber of water distiller will be protected. 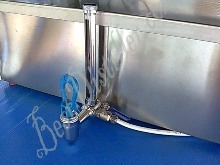 This type of faucet is specially design to fit the distiller with demand pump. By installing this faucet with demand pump and extend to your room, your will discover it is very convenient especially those who are staying in second or third floor. 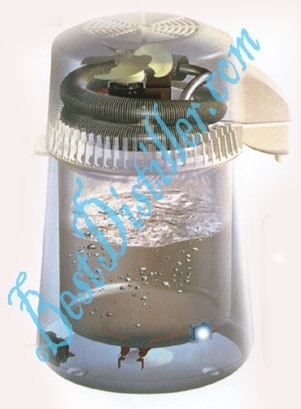 Demand pump is an optional gadget for fully automatic water distiller model. 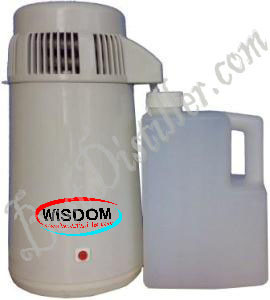 After installing this demand pump, you are able to get your pure distilled water at the place you desire. Heater is the heart of a water distiller. It is used to heat and boil raw water until its boiling point and steam is created. 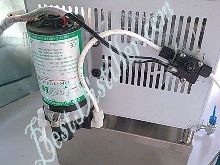 This type of heater is used for fully automatic water distiller and the heater specification are 700W, 1000W, and 1200W. 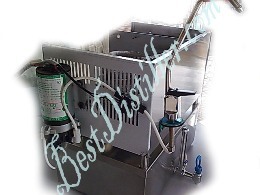 All fully automatic water distiller model have a build in residue drain valve. This drain valve are used to discharge the residue in boiling chamber. The more frequent you discharge the residue, the longer your machine will be last! 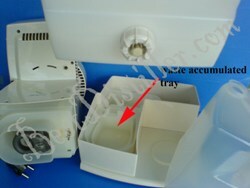 Cooling coil for fully automatic model are placed above the fan. Quality of this cooling fan will determine distilled water output. This is Boiling Chamber for fully automatic model. Raw water are boiled in this chamber and the steam created will flow out to the cooling coil. Water control valve are used in our fully automatic water distiller model. It control the flow of raw water into boiling chamber automatically. WS-303 Heater is a small but durable heater. Its power rating is 600W. WS-303 Motor is the main drive energy for cooling fan. TC-6 cooling coil is a stainless steel cooling coil. It is the best grade of cooling coil and very durable. This distiller features a durable brushed stainless steel outer shell with black top. This is an attractive addition to your kitchen especially if you already have stainless appliances. 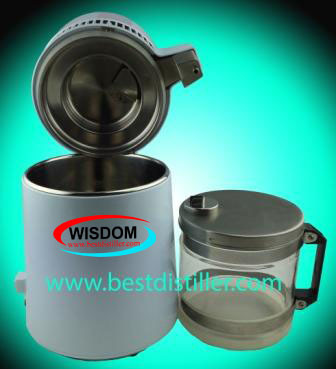 All WISDOM countertop distillers feature a full stainless steel boiling chamber including the upper dome. 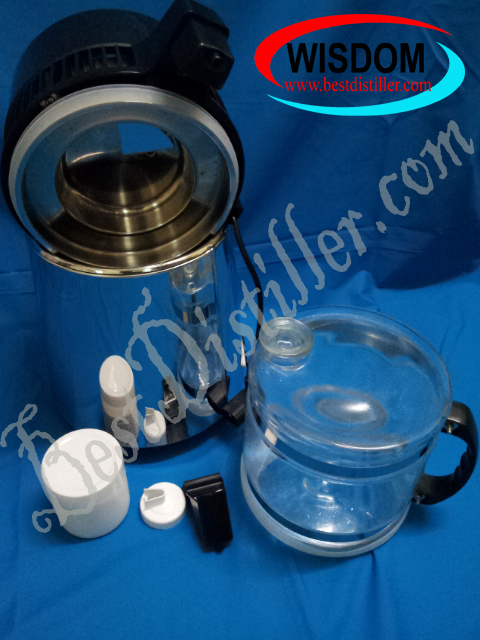 This is a convenient, low cost, easy to use 1 gallon water distiller. Makes up to 4 gallons a day. We have been distributing this distiller to doctors, dentists, laboratories, businesses and individuals for over 15 years. Countertop water distillers offer the convenience of being portable, easy to set up, and less expensive. Most make 1 gallon at a time and shut off automatically when it is finished. You can make subsequent gallons as long as you are there to fill up your water distiller. Distillation is the only process that collects the pure steam! The steam rises from the water, leaving virtually all other contaminants behind, and then we cool the steam down into pure water! Model: TC-203SG is complete build with inner boiling chamber and the outer jacket both made of stainless steel. Manual fill & automatic shut off. Mobile, durable, and a space saver. Automatically switches off when the process is finished, zero damage. No need of filter or cartridges, no pollution. Main export markets: Eastern Europe, North America, Mid East/Africa, Central/South America , Asia, Western Europe, Australia. ~ May be possible of making 12 to 24 lits a day. Large in Capacity - 6 Liters. Distillation will remove all dissolved matter in water (even sea water), such as virus, bacteria, volatile gas, cyst, organic, inorganic and metallic contaminants. Able to use for sea water purification. Good for making homemade wines and distilled water. Enjoy the pure water or other delicious drinking products through the safe DIY process. This system uses the distillatory way to remove heavy metal, chemical, bacteria, virus, small particulates and convert dirty, polluted water, even sea water to pure drinking water. Distillation is the only process that collects the pure steam! The steam rises from the water, leaving virtually all other contaminants behind, and then we cool the steam down into pure water! Model: TC-202S is complete build with inner boiling chamber and the outer jacket both made of stainless steel. Manual fill & automatic shut off. Connected direct to your faucet in your home. Fully automatic model. Automatic stop when distilled water storing tank is full and start to run automatically when the distilled water level drops. Fully stainless steel distillation system. High grade stainless storing tank . Distilled water level sensor to control water level inside distilled water tank. Raw water inlet control valve. Using electronic circuit board to control the flow of raw water inlet, boiling process in boiling chamber and control of water level in distilled water storing tank. Residue discharge valve for easy discharge of residue and cleaning of boiling chamber. Extension of distilled water faucet to the area you desired. For example extend from office pantry room to your room or from your house kitchen to your rest room. Click here to view how demand pump works. Connected to your raw water faucet. 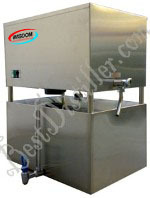 High grade stainless storing tank and made of fully stainless steel. 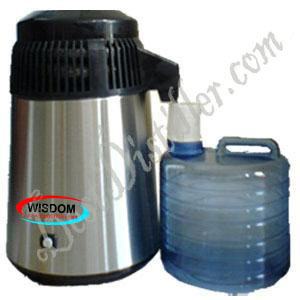 Provide hot distilled water as well as distilled water at room temperature. Hot distilled water will maintain at about 85 degree celcius, you can increase the hot distilled water temperature by swiching on the red switch. Distilled water level sensor to control water level inside distilled water tank and protect pump. 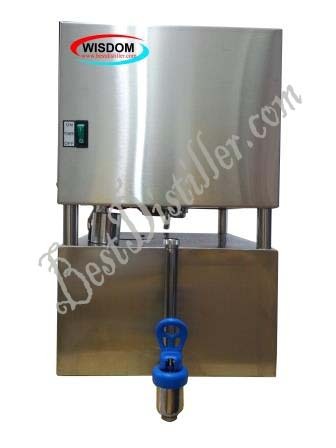 Hot and warm dispenser type water distiller. Suitable for dental / industrial / factory. OPTIONAL: Demand pump. Extension of distilled water faucet to the area you desired. For example extend from office pantry room to your room or from your house kitchen to your rest room. Air cool technology. Features an efficient and quiet running silent fan for cooling. Operate in Single Phasse Electric Power 220V~240V. Using Air Cool technology that NO water will be needed and no water will be wasted to cool and condense. Contact us for price and product details. Recommend for laboratory and industry used. Easy installation (DIY). No plumbing needed. Two indicating light showing distillation process status. 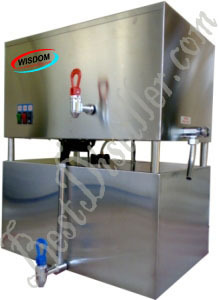 When water level inside boiling chamber lower than safety level, this machine will automatically shut off. 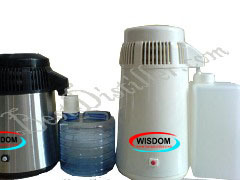 Distilled water storing tank is optional item. Special design to produce distilled water in short time. The first drop of distilled water will flow out after the machine operate for just 10 minutes. Demineralizer is recommended to used with this model to protect and extend the life of the boiling chamber and heating elements. By installing this extended faucet and extend to your room, you will discover it is very convenient. 1. This is a distilled water faucet specially design for extension. Distilled water is flowing from tank to demand pump through ball valve. 2. Distilled water flowing into demand pump then flow to pressure switch. 3. From pressure switch outlet, you can connect a tube with the length of your desire distance, for example to your room, and finally connect to a faucet (final destination faucet). 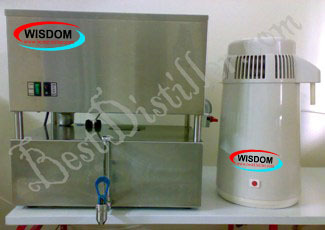 Wisdom Trillion Enterprise is the expert in water distiller and we are in this line for more than 15 years! 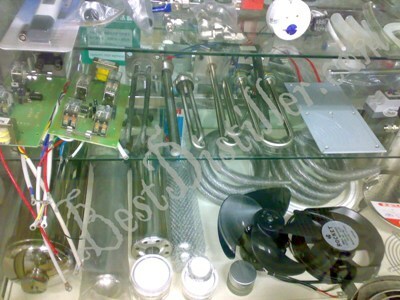 We are very concern in after sales service and you have no worry on the water distiller's parts. With our technical support team, we will advice you on trouble shooting and do & don't for water distiller to prolong the life span of your water distiller.